Today's Tarot Has It All! TODAYS TAROT HAS IT ALL! One of the blessings (or curses?) of contemporary Tarot is the manner in which Tarotists relate the cards to an enormous variety of theosophies, philosophies, religions, mythologies, schools of estotericism and psychology, and more. Here is a brief list of things which have been related to Tarot. I assure you that they have all been passionately promoted by more than a few Tarotists over the centuries. Magic(k). Black, White, High, Low, Chaos, & Trutti Frutti. Herbs. Cannabis, St. Johns Wart, Prozac, and more. Nudism. 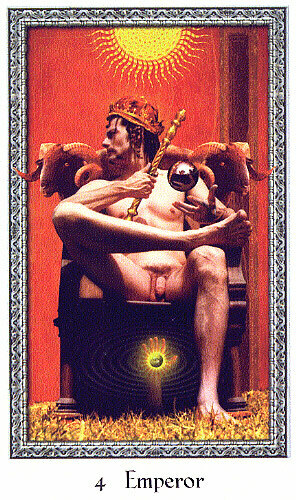 One deck shows all: Stevee Postmans The Cosmic Tribe Tarot. Divination. Highfalutin term for the old-fashioned lowly art of fortune-telling. Qabala, Kabala, Qaballa, Kaballa, Quaballa, Kuhbahluh, or QBL. BTW, if G-d is so smart why doesnt He/She use vowels and spell words one way? Freemasonry. Not to be confused with Operative or Inoperative Masonry. New Age. That is, simplified, recycled Old Age Western Esotericism. Western Esotericism. Highfalutin term for spooky, old-fashioned Occultism. Legendary Lands. Atlantis, Mu, Wonderland, New York City, etc. Egyptomania of the 18th and 19th Centuries. See works by Gébelin, Etteilla, Christian, and many others. Illustration (left): A prime example of Egyptomania. It is not a sketch from a turn-of-the-century, second-rate production of Aïda. 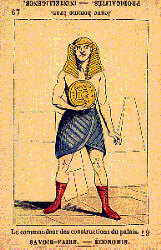 Instead, it is the Page of Coins from Jeu de la Princesse Tarot (c. 1876, re-published by Editions Dusserre). Click the image for a larger one. Crystals. No, not meth amphetamine. Imaginary Beasts. Unicorns, Dragons, Shekinahs, Astaroths, Animi/ae, and many more. Contact Sports. Baseball, Goetic evocation, etc. Christianity. Orthodox, heterodox, and old-fashioned heresy. Hemeticism. No, not living as a recluse. Astrology. Including 1,327 true systems of Tarot correspondences at last count. Alchemy. No, not making gold; instead, you know, the King and Queen getting it on together. 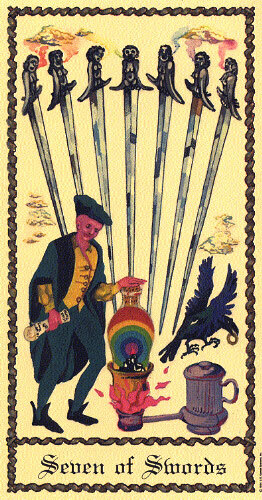 Illustration (left): A working alchemist is depicted on the Seven of Swords from The Medieval Scapini Tarot by Luigi Scapini (copyright &COPY; 1985 U.S. Games Systems). Click the image for a larger one. Alphabets. Hebrew, Greek, Sanskrit, Latin, Pig-Latin, etc. I Ching. Including extensions thereof, e.g., fortune cookies. G(g)od(dess) Worship. For those who insist on covering all bases. Runes. No, not crumbling, ancient buildings. The One True Forged Golden Dawn Manuscript. Including the Trithemian Secret Decoder Ring. Rosicrucianism. Including the Cagliostro Egyptomaniac Rite Thrice Revised. English Lodges. Probably pubs too. Art of Memory. And you definitely need it to master all 3,374 true systems of Tarot-Cabala correspondences. Mythology. Graeco-Roman, Norse, Celtic, Arthurian, Mayan, Modern Urban, etc. Numerology. Tarot = 3 x 7 + 1 + 4 (10 + 4) = 78, etc. Fairies. No, not the Sugar Plum and Tooth types. 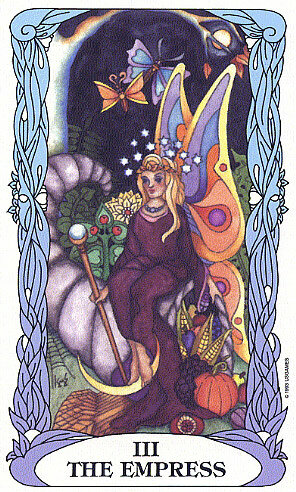 Illustration (right): The Empress as a fairy enthroned on a horn of plenty from Tarot of a Moon Garden by Karen Marie Sweikhardt (copyright &COPY; 1994 U.S. Games Systems). I dont think this deck is supposed to be funny, but it is. Click the image for a larger oneif you can stand it. Gnomes. No, not the Gary Bauer type. Dumbed-Down Jungian Psychology. Including your Synchronistic Shadow Puppet Personality. Voo Doo. Also, Ju-Ju, Hoo Doo, Voudun, Moo-Moo, etc. Sacred Geometry. Not to be confused with Euclidian or non-Euclidean types. Shakespeare. Ok, Bacon and Blake too. Mayans. Including their wacky, wild, and totally unintelligible calendar. Indians. Native American, Casino, Asian, etc. 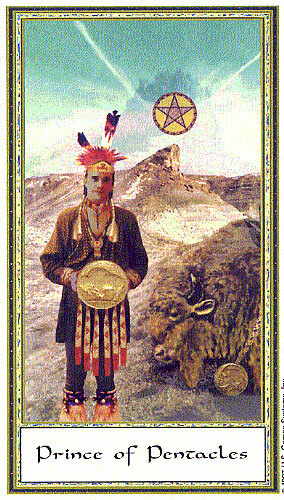 Illustration (left): The Prince of Pentacles as a Native American from The Gendron Tarot by Melanie Gendron (copyright &COPY; 1997 U.S. Games Systems). Click the image for a larger one. Wicca or Wicce. That is, good old-fashioned witchery. Totemism. Move over Dr. Doolitte and Mr. Ed! Subatomic Physics. Move over Messrs. Newton and Bohrs! The Holy Grail. You didnt know that the Magdalene was the first cardreader ever?! Gems. But no card corresponds to cubic zirconium (sigh!). James Bond. Groan! See Live and Let Die, which features Tarot of the Witches. Knights Templar. Including their ever lovable Baphomet and mysterious talking head. Shamanism. Drugs, rattles, rock-and-roll, and more. Satanism. At least this is the heartfelt position of a lot of people. LAST BUT FAR FROM LEAST. . .
Tarot the Card Game. Remember? 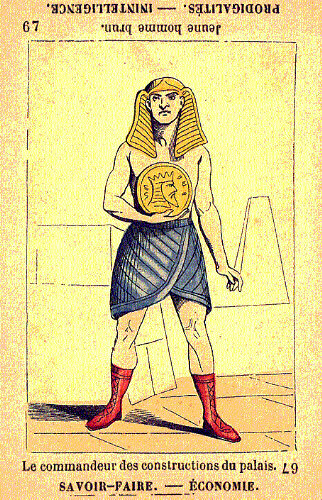 Tarot was invented to play an entertaining game. Youve come a long way, baby! Copyright &COPY; 2000 James W. Revak. All rights reserved. Version 1.0 (4/1/00).